Though their initial color is green, the pods of Chinese lantern plants mature at the end of the growing season (early fall) into the color that immediately calls to mind another "lantern" popular in fall: the jack-o-lantern. Their autumnal color makes them valued for fall decorations. But these plants have their drawbacks and won't be a good fit for all gardeners. There are two reasons not to grow Chinese lantern plants. They are invasive plants, spreading via underground rhizomes and by reseeding (if you do not harvest all of the pods). And they are poisonous plants, a concern if you have children or pets in the yard who may eat them. As viny plants, they can be treated as ground covers. Chinese lantern plants have heart-shaped leaves and bear white flowers. The flowers are insignificant and not the reason for which the plants are grown. The plants are grown for the 2-inch wide, papery pods or "calyxes" that eventually surround the flowers. Each of the pods later encases a berry with seeds. In fall, these pods turn bright orange. The pods are like traditional Chinese lanterns (the lit kind), not only in shape but also their papery texture. This is what gives them their common name. Once they're mature, most of the care needed by these plants is keeping insect pests at bay. It's also important to decide ahead of time whether or not you wish to grow these plants directly in the ground (without a barrier or container) and take your chances with their invasive nature. It'll take less time and energy to think the matter out in the beginning and act accordingly than to decide later that you don't like the way they spread and try to remove them. Grow Chinese lanterns in full sun in cold climates. In warm climates, the plants can be grown in partial shade. Grow them in well-drained soil. Once mature, the plants become reasonably tolerant of poor soils. When young, plants need to be kept watered. The soil should feel moist, but not soaked. They are also reasonably drought-tolerant ground covers once mature, although flower and pod production will be better with regular watering and feeding. This plant can stand cooler temperatures but avoid exposure to frost. It does not have any humidity requirements. The seeds will germinate when temperatures are between 60 and 70 degrees Fahrenheit. Fertilize monthly during the growing season in the spring. Compost works well. Mulch around the plant to maintain soil moisture. Gardeners usually buy seeds for the plants and sow them outdoors in late spring. Some start them indoors for a head start and transplant them outside after all danger of frost has passed. Both the unripe berries and leaves of the Chinese Lantern Plants are poisonous; keep children and pets away. 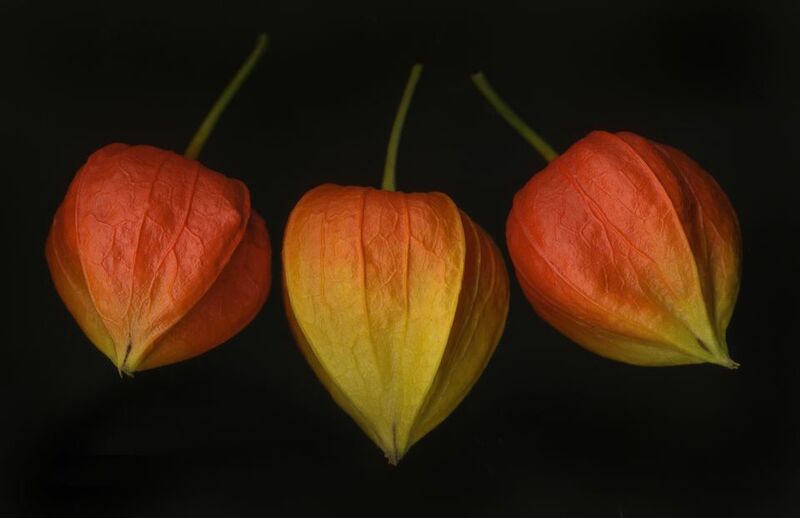 Chinese lantern pods are used in Halloween crafts (due to their orange color), harvest-themed decorations, and dried flower arrangements for fall. If you will need to harvest only a few pods for such purposes, consider growing the plants in pots (sinking the pots into the ground is one design option if you do not wish the pots to be in view). Not only is this a convenient way to grow a small crop of the plants, but it is also a good way to fight this invasive perennial's desire to spread. If you must grow them directly in the ground in your garden, one way to prevent their spread is to use a barrier to act as a "firewall," as you would keep a running bamboo from spreading. When the pods have changed to their much-valued orange to reddish-orange color, it's time to harvest them. Remove a plant by cutting its stem off at ground level. Strip the leaves off, then suspend the whole plant, upside down, from a nail or string. Dry the harvested pods in dark, cool places with good ventilation (perhaps a garage). Drying should be complete in a few weeks' time. If you can't grow and harvest your own Chinese lanterns but wish to purchase some for crafts or ornamentation, you can buy them from florist shops and craft stores. These viny perennials are hardly low-care plants. Chinese lanterns are subject to many plant diseases and insect pests, including false potato beetles, cucumber beetles, and flea beetles. It's truly a shame to witness a beautiful pod form during the summer, only to have it later become riddled with holes (chewed out of it by insects). Neem oil and/or insecticidal soap sprays should help against most of the offending pests. Because various bacterial and fungal diseases can attack them, give your Chinese lanterns enough room (space them 3 feet on center); crowding promotes the spread of such diseases. In addition, cut back and properly dispose of foliage in fall if your plants have had any disease problem to minimize its spread. Do not put it in the compost bin. If overcrowding occurs, divide the plants in spring.